The Verve Kickstarter project wants to bring sensor control to any device at any time. Using a controller box and seven sensors the Verve plugs into your computer and allows users to use anything as a controller. The full complement of sensors includes a magnet sensor, motion sensor, touch sensors, force sensors, a rotation sensor, light sensor and a pushbutton sensor. Jay Silver and his Makey Makey project inspired the touch sensor and using connectivity to turn anything into a controller. Operation of the system looks very easy. 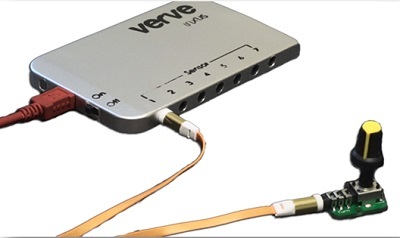 The Verve plugs into any USB port and has inputs for seven sensors. The application feels intuitive and allows control of any sensor in any port while giving limit controls and thresholds. Advanced users can dig deeper into the programming and control speed and sensitivity. Possibilities seem endless from the examples in the video. 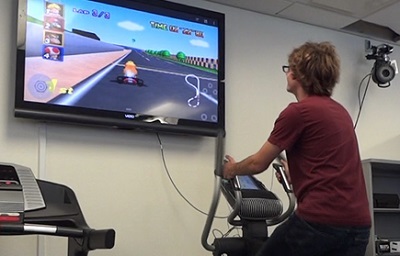 Users control a racing video game with a sensored bicycle, Angry Birds is controlled with an actual slingshot, and a huge Nintendo style game controller is created for jumping stomping actuation. The developers are excited to see what the general public will do when the Verve is released out into the world for everyone to implement. inXus is the company behind the Verve, and the project currently supports Windows and OSx with Linux functionality planned for early 2014. The funding project has already met its goal halfway through the pledge period. Currently the developers want to bring this product fully realized to sell to the general public. I would like to see the software and application re-released as open source for makers and programmers to experiment with and add functionality. Based on the products shown in the video the sensors look like they would also benefit from some enclosures or protection. The education component of Verve is very promising. One of the reward tiers includes additional sensors and is designed for science experiments. There's also curriculum already developed for teaching science and technology lessons. This is a huge sell to eductors trying to justify the expense of the project to their administration.